Here are the June 2016 releases from Blue-Eyed Girl Lacquer. 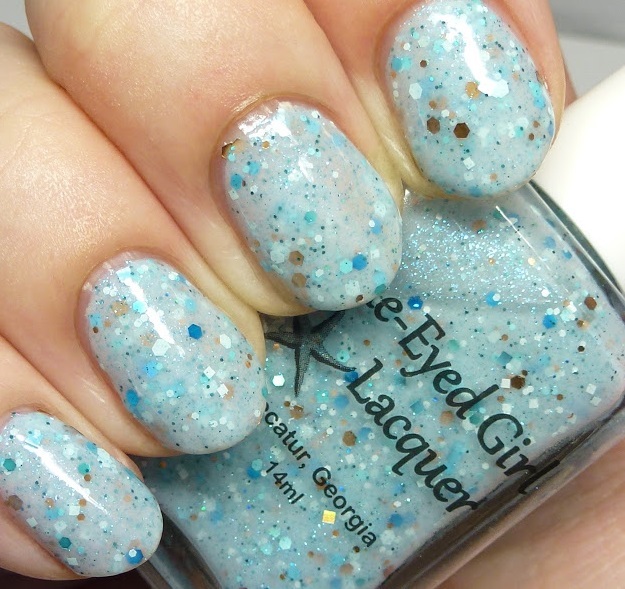 Julie, the maker of Blue-Eyed Girl Lacquer had to push the release of these polishes back to July. However, I doubt any of us mind because these polishes are well worth the wait. This release will consist of a mix of preorder and “first come, first serve” polishes. Today I have the new Siren and the BEGL in the Destination Duo with 6Harts. These will release on Thursday, July 7th at 3:30pm EDT. Excited to see them? Here we go! This lovely addition to the BEGL’s Sirens is a bright strawberry pink with rose gold flakies, neon pink to blue shifting flakies, and silver ultra holographic glitters. This polish was opaque for me in two coats and application was a breeze despite how much stuff is in the polish. The polish does dry a bit textured so you will want to topcoat it. I didn’t notice any bumpiness or anything out of the ordinary, just typical micro glitter texture. Topcoat will also help the glitters and flakies stand out better and really sparkle. This is a warmer pink with just a drop of coral to it. I really love the name because the polish reminds me of drinking fruity frozen adult beverages in the shade. This polish will be available on the BEGL website for preorder on Thursday, July 7th at 3:30pm EDT and will sell for $12.00 USD. If there any overpours they will be available for sale at the end of the month. This polish is part of this month’s Destination Duo with 6Harts. I really love these Destination polishes because they are inspired by a photo and place. For this month’s the inspiration photo for the duo was taken by Courtney at Lolo Pass in Montana I really dig it. It’s not a picture you would typically pick for a polish inspiration and I really love how creatively it was interpreted. I received the BEGL in my press release package. For those of you who love those olive type greens this will absolutely be up your alley. Pining for the Pass is a pine green polish with red to gold shifting flakies, bright gold flakies, and clear ultra holographic flakies. I really liked this one and it’s a color combination we don’t always see. It makes me think of sunlight sparkling through the spaces in between leaves on a tree. The red to gold shifting flakies create a strong shimmer effect in the polish with flecks of gold and holographic. It’s nice to have something different and this really does make me think of a hike through the woods. The formula on this was a bit sheerer and like a true jelly. This will be a 2-3 coat polish depending on application. Honestly, even if you have a slight bit of visible nail line you will really have to strain to see it because there’s so many flakies in this polish. Like the Siren, this dried slightly textured and needed a topcoat. Pining for the Pass will release with a polish from 6Harts called Rock of Ages. I didn’t receive that polish but Rock of Ages is described as a medium gray polish with green, color shifting, and dark gray micro flakies along with a small amount of micro glitter. You’ll want to check out the BEGL Website as well as the 6Harts website for photos. The duo will also come with bonus glitter packet full of coordinating glitters in various colors and shapes. They are meant to be worn with the polish for nail art purposes but not meant to be mixed in with them. You will be able to purchase this month’s destination duo from both BEGL and 6Harts websites. However, be aware that 6Harts does not ship internationally. The duo will cost $20 shipped domestically and $20 shipped with a prorated fee for international customers. Both of these polishes are really lovely and have excellent formulas. It’s important to note that bEGL’s polishes do run a bit on the thicker side and you may need to add a couple drops of thinner if you prefer your polishes to be thinner. I have never had a bad polish from BEGL and they are well worth having. Which of the two polishes draw your eye the most?